Looking for an alice rucksack? A rucksack is one of the important gears every aspiring shooter must have. It is purposely designed for survival and outdoor use. It is durable and keeps your necessities intact and in place even when you are on the move. ALICE rucksacks is one of the tactical backpacks available in the market that can make packing a whole lot easier. This type of rucksack usually has wide compartment making it easier to carry around. Thus, requiring you less effort even traveling from one shooting area to the other. A comfortable pack can mean having everything you need neatly organized in one place. 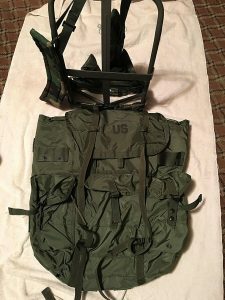 Today, we’re going to look at various popular ALICE packs the United States military used from the 1970s to the late 1990s. These packs are tough, big, and haven’t gone out of tactical fashion. In this article, we’ll break down what this pack system is and review the best packs, so you can figure out which one suits your adventure needs. It was a United States Army standard in the 1970s and has since been replaced by the MOLLE system. What’s great about ALICE is its ruggedness, size and ability to be modified. Though these packs aren’t manufactured anymore, you can still buy them through surplus retailers in pretty good condition. It pays off to know which items can give you value for your money. The following are the best ALICE rucksacks you can find in the market. Now that you know a little more about ALICE packs and are thinking about what you might buy one for, let’s get into the reviews. First up, the Medium pack! The Medium ALICE pack comes in Olive Drab Green 420 denier nylon duck fabric. It features three pockets on the outside of the pack with cinch buckles and one central compartment. 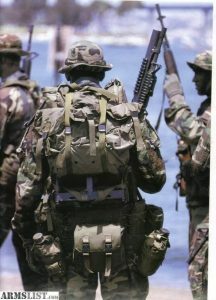 Internally, there are straps to shorten the pack when it’s full volume is not being utilized. This pack measures 19″ x 20″ x 11″ and weighs 2.8lbs. You can use the pack frame with this pack but it’s not as necessary to use as it is with the large pack. With its pocket design, storing both big and smaller item is easier. The straps and buckles are reliable, resulting to more comfortable experience. It’s a huge bag that can store a lot of items, perfect for camping and hiking use. Attachment points for more gear. Can carry with or without the frame. Great for a week out if you’re a camper/hiker/hunter. Loose straps can snag and get in the way. Not as comfortable for long treks. All of these packs are pre-owned and come with the risk of being torn, stained, or not waterproof anymore. To check out prices through Amazon, click here and here. The Large ALICE pack was designed for a two-week stint in the field. 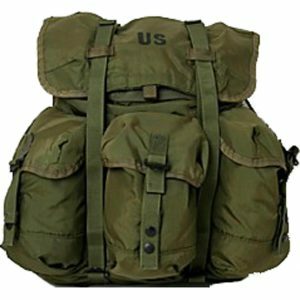 It’s made in Olive Drab Green and features six snap closure pockets on the outside, which is three more than the Medium. It also has a larger central compartment that closes with a drawstring. It measures 22” x 20” x19” and weighs 3.8lbs.The frame and shoulder straps are included. The waterproof coating on the inside of the pack helps in protecting your items in case if rain starts to pour in during your shooting activity. The map pocket can be very handy if you plan to use this rucksack for hiking or traveling. This is a large rucksack, which means you can definitely put a lot of item without a problem. You might need a frame to evenly distribute the weight around your body. The item comes with free frame and shoulder straps, which helps you a lighter experience even if you are carrying the bulk of items. Buckles and straps that won’t wear out quickly. Can fit more than you can probably fill. Too big for a day hiker or hunter. Main compartment is so deep that for some the center of gravity is thrown making difficult not to lean forward to compensate. To check out prices through Amazon, click here. The ALICE pack clips are meant to attach bags, pouches, and kits to your bag just in case you couldn’t fit it all in the bag. Or maybe you wanted to have fast access to something in particular or to dry something that’s gotten wet. The dimensions are 5 x 2.5 x 0.9 in and these come in ten packs. These clips could be an economical purchase for your wallet and your pack! The clips are durable, which will put you at ease that the item its holding is not going to fall. These clips can be used around your web belt. Works with both H and Y style harnesses. 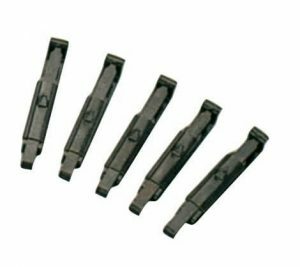 This clips are made of steel which can add too much extra weight depending on your objective. The spring is tight and can be difficult to open. 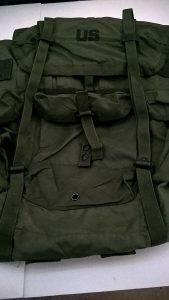 How to Pick the Best ALICE Rucksack? As you can tell, ALICE rucksacks come in two sizes: the “medium” and the “large”, and the system is made up of a few basic components that you can alter depending on what you’re doing (kind of hobby) and what you’re carrying (tools and equipment). The truth is that rucksack can serve multiple functions, so determining your purpose of buying at the first place will help you come up with the most ideal rucksack to buy. The following are the main components of an ALICE rucksack. Having an external frame increases the ventilation at your back which can be very helpful if you’re someone who sweats easily or you know you’re in this adventure for the long haul. ALICE packs come in Medium and Large, both of which can fit on an ALICE frame. The frame however, is not adjustable. 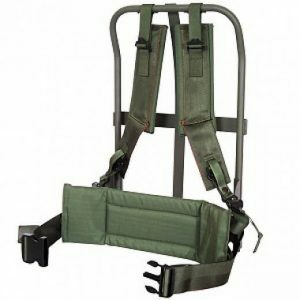 The padded shoulder straps, quick release sternum strap, and hip belt are also attached to the frame. The external frame helps to position the weight of the pack higher on your back which helps you to walk more upright. It also keeps the load bearing down on your hips instead of pulling back on your shoulders which would make you lean forward. ALICE packs were made with an external anodized aluminum frame. You don’t see this as much with newer gear because an external frame is bulkier and heavier than a pack with an internal frame. ALICE was also likely designed with an external frame so more side pockets could be added to the pack. The adjustable, padded, shoulder straps help to distribute the weight of the load and reduce discomfort. It’s extremely to keep an eye at the belt component before considering a purchase. The belt determines how the pack’s weight can be evenly distributed around your hips for traveling comfort. The belt is highly adjustable, whether you’re on the smaller side of having a 30in waist or the larger side, this belt will fit you. There is also an adjustable waist pad that molds to your spine for added comfort and support. Finally, there are eyelets for you to attach the gear and equipment you want to have access to quickly. ALICE packs come in two sizes (Medium and Large). We’ll get into the specifics of what that means for our review. For now, it’s important is to think about what you’ll be using your pack for. Ultimately, that will determine the size of the pack you’ll want. Are you more of a day hiker or shorter excursion kind of person? The Medium will probably be the right way to go for you. For longer distances or weight training, you’re going to want to make sure you use the large pack and it’s frame because your body will need the extra support. The pack liners are plastic treated with chemicals to make it waterproof and mildew proof. They’re also made small enough that you can fit it in one of the side pockets of the pack. Pretty convenient, right? There’s just one downside: These chemicals can make the liner smell. But if you don’t want to spend the money, are sensitive to chemical smells, or aren’t one for aesthetics, you can always line the inside of the pack with a trash bag or throw one over the outside and tie it. ALICE packs are synonymous with ruggedness and quality. Time hasn’t even tarnished their reputation. Because you can modify an ALICE pack, the deciding factor really narrows down to size. A casual day hike isn’t going to fill up a Large and you won’t need the support of the pack’s frame since you’ll be carrying under 50lbs. Activities that require you to carry weight in the neighborhood of 70lbs like tools, is going to require the extra room and support of the large and the frame. For long backpacking trips, the answer is more up to the individual. Most hikers keep their pack weight to thirty pounds, but that all depends on your body, gear, and needs. It’s always better to carry a smaller pack than a larger one so you’re not carrying around extra weight. Learning how to properly pack your gear in an ALICE pack can also make a world of a difference in terms of weight distribution and space needed. For most people with a standard and casual type pack usage, the Large ALICE pack is probably going to be too large. There will be a lot of extra weight that the average person isn’t going to want or need to carry around. Whichever pack you go with though, an ALICE is sure to outlast all of your adventures! Let us know in the comments below if you’ve got one of these bags or which one you’re going to buy.